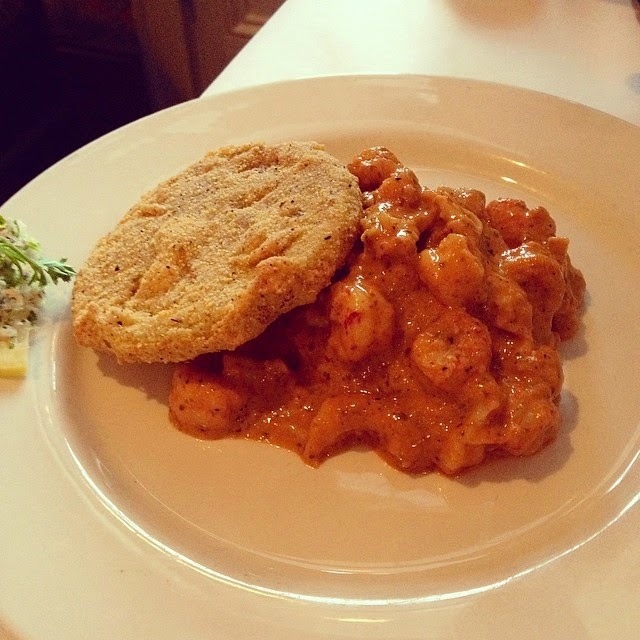 Babymoon in New Orleans - San Diego Dining Dish! Hello! It's been wayyyy too long since I've done an update. For those of you who don't know me personally or on Facebook, I'm happy to announce that we are expecting our first baby this September! I am in the 2nd trimester "honeymoon" phase after a quite sickly first trimester. Food was just not exciting at all for those months. But now I'm feeling mostly like my old self, and excited to share our babymoon with you. 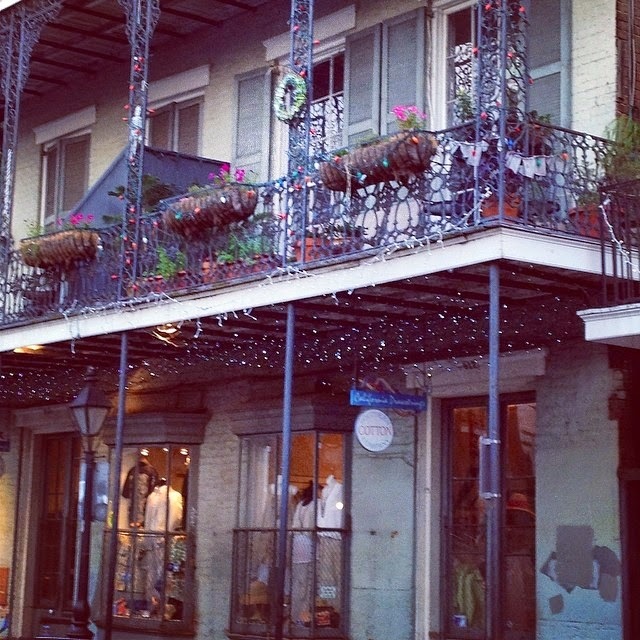 To stay domestic, and because I had never been there before, we chose wonderful New Orleans as our destination! After all, it's one of the culinary capitals of the world, and unlike many other possibilities, doesn't have a lot of hills or strenuous walking for a pregnant lady! Our host for the weekend was kind enough to leave tons of snacks in the room, including Zapp's potato chips! Our favorite flavor? 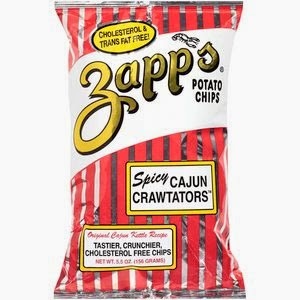 Spicy Cajun Crawtators! We were off to a good start! The very first place that we visited after settling into our hotel was the famous Emeril's, owned of course, by Emeril Lagasse. A bowl of hearty gumbo was just the thing to put me in the mood for all of the wonderful Cajun and Creole dishes to come that weekend! My husband had the oyster stew with bacon, which I normally wouldn't order, but it was amazing! So rich and delicious, and a perfect sample of his wonderful recipes. Of course, this meal was small because I knew that afterwards we were heading to that New Orleans institution, Cafe du Monde! The menu here only consists of Cajun-style donuts, beignets, and of course, cafe au lait! Believe the hype! The beignets were perfect! Sweet, fluffy on the inside, and crunchy on the outside. The copious amount of powdered sugar was also appreciated. The next day was lunch at The Joint! Famous for their barbecue, The Joint is a little far flung from the center of town and French Quarter, but well worth the walk or taxi ride. There are many choices for the barbecue lover, but we chose to share the three-meat combo platter, which was more than enough for my husband and me. We chose the beef brisket, ribs, and the sausage, with a side of mac and cheese. The beef brisket was incredible, as were the tender, flavorful ribs. The sausage, however, was a bit disappointing. A little too fatty tasting, and in general just not enjoyable to me. The mac and cheese was a great side, homemade, and something that I would definitely order again. Afterwards, we headed back to the Quarter for more beignets! I'm a donut fiend, and I couldn't get enough of these things while we were in The Big Easy. This time, we visited the much lauded Cafe Beignet. Favored by many over the beignets at Cafe du Monde, I found these beignets very disappointing. Skimpy on sugar, and fried in a different oil than CDM, these tasted strongly of grease and fat. Not appetizing. The original is best for a reason! 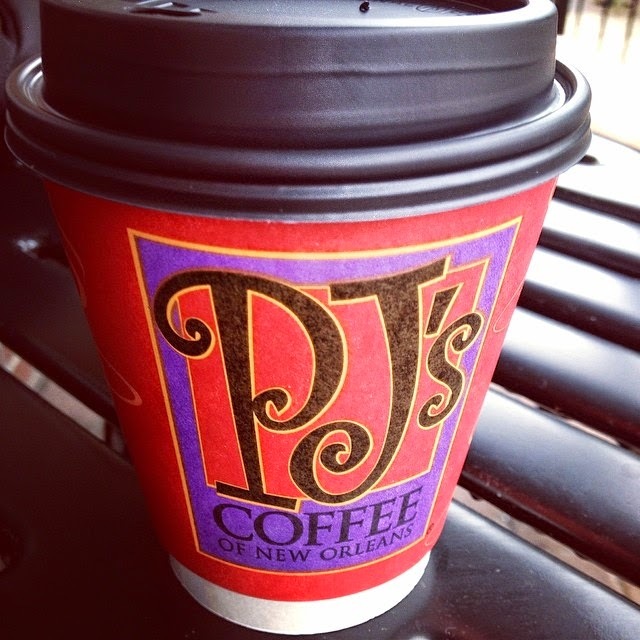 Many cups of delicious PJ's Coffee, a New Orleans chain of coffee shops were consumed. Southern Wedding Cake and Southern Pecan were big favorites of ours. Another spot worth visiting is Drago's Seafood. Recommended by a San Diego friend, the thing to get here is the oysters! Charbroiled oysters, soaked in garlic butter and breadcrumbs, yum! They weren't the most photogenic things, but trust me, they were delicious. So good, in fact, that we made a second visit just to sit at the bar and eat a dozen! Served with a crusty piece of poboy bread to soak up the delicious buttery sauce. For lunch, I had their fried shrimp meal, which included a salad (a welcome thing after all of the rich food we'd been eating!). The fried shrimp were such a treat. Fried shrimp do not really exist much in San Diego, so this dish was something that I had missed since I lived in the South over a decade ago. 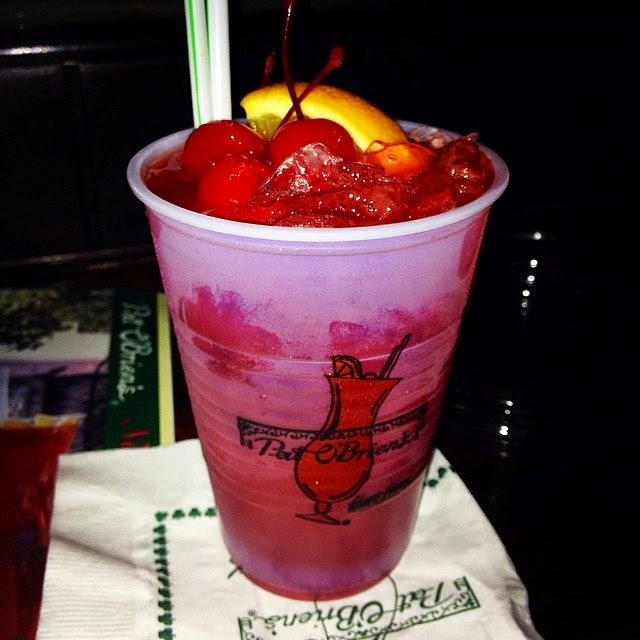 Next up, Hurricanes at Pat O'Brien's! Famous for creating the Hurricane, I knew that we had to try it. I got the virgin version, call the Eye of the Hurricane, of course, but it was still quite tasty! And another visit to Cafe du Monde! Next up was Coop's Place for their famous jambalaya! Coop's is by no means highbrow, but many times, I've found some of the best food at the local watering holes and dives. The long line outside proved it was indeed great! The jambalaya was amazing! Filled with shrimp, crawfish, rabbit, and andouille sausage, this was a meat fest! Very spicy and filling as well. A bowl of very spicy gumbo was delicious as well, although I wish for a bit thicker broth for the soup. I'd return for the jambalaya, but I would probably pass on the gumbo. Too many other great things to eat! Later, we had a dessert of white chocolate bread pudding at the Dickie Brennan restaurant, Palace Cafe. Decidedly Creole in the food and presentation, Palace Cafe is an absolutely elegant place for a meal. The bread pudding was tasty, sweet, and felt far too fancy for a simple dish of leftover bread soaked in an egg, sugar, and cream mixture. The grand finale was a sumptuous meal at the famous K-Paul's Louisiana Kitchen! 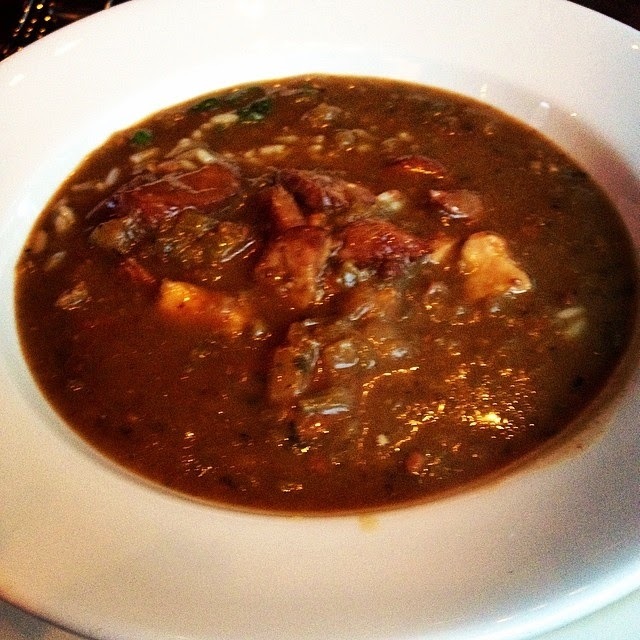 Owned by renowned Cajun chef, Paul Prudhomme, who is famous for bringing Cajun cooking to the masses, K-Paul's is a classic New Orleans restaurant, with a comfortable, yet elegant atmosphere, serving up Bayou favorites like rabbit with mustard and seafood gumbo. I've not had fried green tomatoes in years, so we decided to go with the fried green tomato and shrimp remoulade appetizer. Absolutely delicious. The tomatoes were coated with a crispy, spicy breading, and the remoulade was a perfect specimen of spicy shrimp salad. For my main meal, I chose the breaded, fried flounder with a bacon gratin sauce, served with a shrimp stuffing and seasoned vegetables. The fish was delicious! The sauce was rich and creamy, and although the stuffing was a bit on the sweet side, it was a perfect compliment to the fish and vegetables. My husband went with the house specialty, blackened drum. Served piled with sauteed and seasoned crawfish, this dish has earned its place as the crowning jewel of K-Paul's kitchen. The fish was so flavorful, and was complimented well by the blackening seasoning. I loved the homemade mashed potatoes served as a side. Of course, dessert was going to happen! For dessert, we ordered more bread pudding! This dessert was a perfect archtype of bread pudding: made from leftover muffins and bread from the house bakery, it was sweet and very soft from soaking for hours in the milk and egg mixture. The bread was positively soggy. That sounds like a bad descriptor, but with bread pudding, you want soggy. Topped with the most rich chantilly cream sauce, this was the most decadent thing that I ate all week. 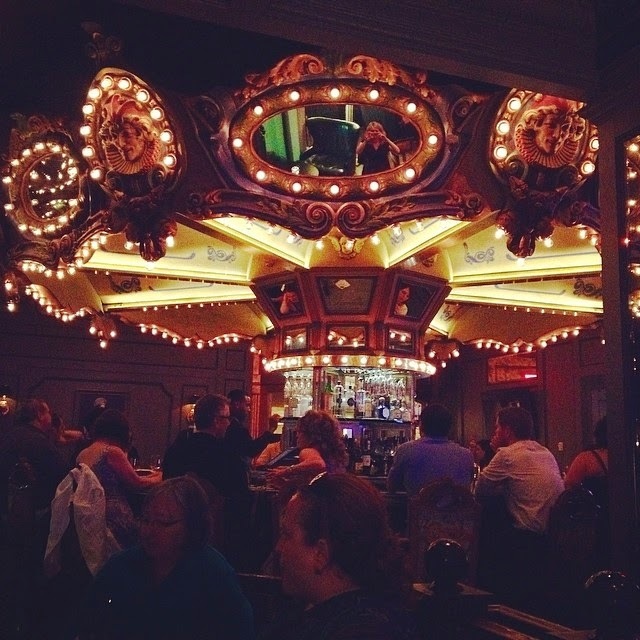 Our last night wound down with a Hurricane (and Sprite for me) at Carousel Bar. Very swank and old school, serving classic cocktails in a pristine setting. Check out that beautiful bar (and my reflection holding the camera)! And that, my friends, wraps up my eating tour of New Orleans. 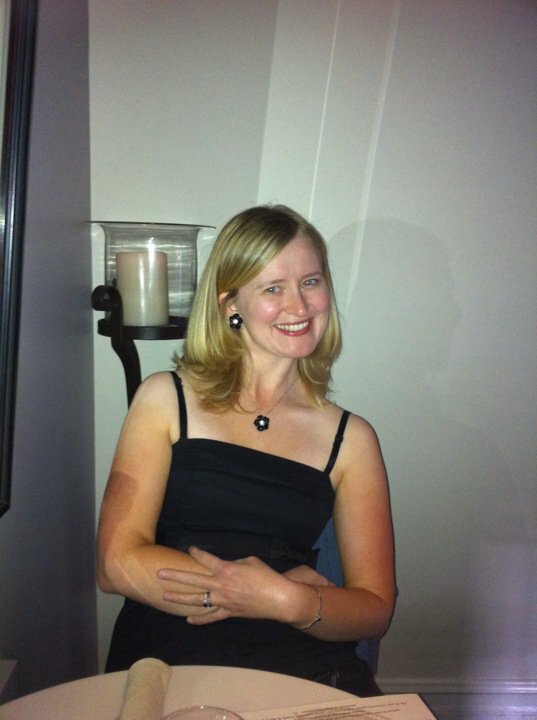 I really hope that I'll get better about this blog as my pregnancy progresses. I've a few posts in store for the coming weeks detailing some of the fun summer happenings around San Diego. 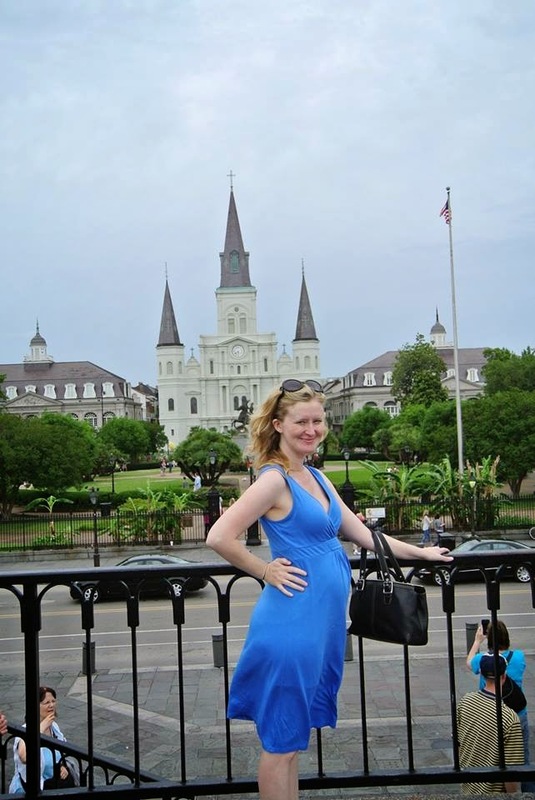 I leave you with this parting shot of the baby bump in Jackson Square. Congrats!! And I went to Cafe Du Monde too when I was in New Orleans a year ago... loved it!